Pairs well with: Savory appetizers and grilled seafood dishes. Great to start a dinner party or as a refreshing topping off at brunch. Place desired amount of ice cubes in glass. Pour Prosecco, Aperol & San Pelligrino over ice, gently stir. Garnish with round slice of a blood orange. Aperol is the star of the show so you don’t have to break the bank on top quality Prosecco, any good $10-15 bottle will do nicely. Blood oranges give the best color but Valencia or Navel orange slices work well too. San Pelligrino is our favorite but you can use with any unflavored sparkling water. To make a pitcher for up to 6 guests, use an entire bottle 750 oz. bottle of Prosecco, 12 oz. 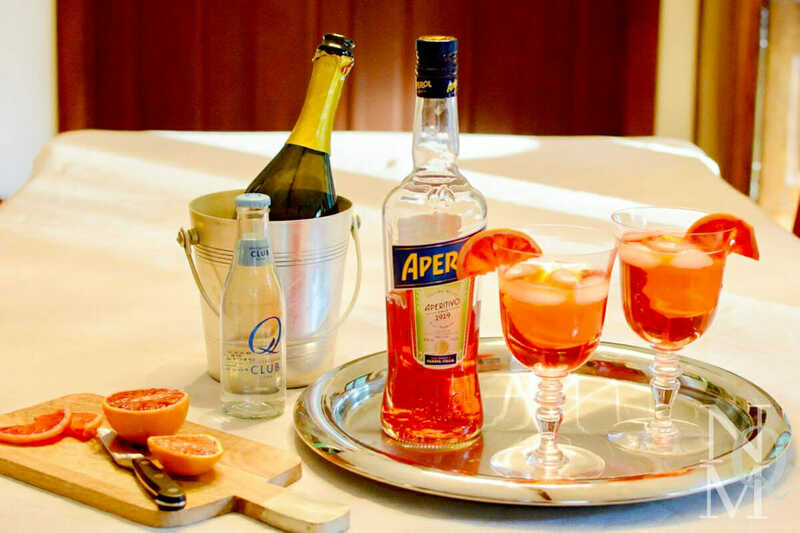 of Aperol, 6 oz. of sparkling water and 6 orange half- rounds. This spritz is often served in highball glasses but you can also serve it in large wine glasses or vintage iced beverage glasses (which have short stems).